Georges Descrières (15 April 1930 – 19 October 2013) was a French actor. He appeared in 52 films and television shows between 1954 and 1996. He starred alongside Anna Karina in the 1962 film Sun in Your Eyes  and portrayed the gentleman-burglar title character in the internationally successful TV series Arsène Lupin . Sun in Your Eyes is a 1962 French romance film directed by Jacques Bourdon and starring Anna Karina. Arsène Lupin is a fictional gentleman thief and master of disguise created in 1905 by French writer Maurice Leblanc. He was originally called Arsène Lopin, until a local politician of the same name protested. The character was first introduced in a series of short stories serialized in the magazine Je sais tout. The first story, "The Arrest of Arsène Lupin", was published on 15 July 1905. The Legion of Honour is the highest French order of merit for military and civil merits, established in 1802 by Napoleon Bonaparte and retained by all later French governments and régimes. Caroline and the Rebels is a 1955 French historical adventure film directed by Jean Devaivre and starring Jean-Claude Pascal, Sophie Desmarets and Brigitte Bardot. It is loosely part of the Caroline chérie film series, although the character never actually appears and is seen only in a miniature. Tonight or Never is a 1961 French comedy film directed by Michel Deville and starring Anna Karina. Françoise Dorléac was a French actress. She was the daughter of screen actor Maurice Dorléac and Renée Simonot, and the elder sister of Catherine Deneuve. The two sisters starred together in the 1967 musical, The Young Girls of Rochefort. Her other films include Philippe de Broca's movie L'Homme de Rio, François Truffaut's La Peau douce, Roman Polanski's Cul-de-sac and Val Guest's Where the Spies Are. Yves Robert was a French actor, screenwriter, director, and producer. Arsène Lupin is a 2004 crime-adventure film, based on the series of novels created by Maurice Leblanc, directed by Jean-Paul Salomé and stars Romain Duris, Eva Green and Kristin Scott Thomas. It was a co-production of France, Spain, Italy and The United Kingdom. Jean-Pierre Cassel was a French actor. Édouard Molinaro was a French film director and screenwriter. Arsène Lupin contra Sherlock Holmes is a 1910 German drama film serial directed by Viggo Larsen. The survival status of any of the episodes is unknown. Geneviève Gabrielle Grad is a French actress. 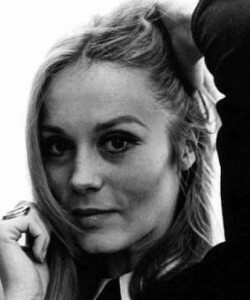 She played Nicole Cruchot, the daughter of Marshal Ludovic Cruchot in the first three films of the Gendarme of Saint-Tropez series from 1964 to 1968. She has, among others, played in two films with Paul Guers as his partner: Flash Love (1972) and Libertés sexuelles (1977). She has also appeared in several made for TV films and TV series in the 1960s and 1970s. She had a son with Igor Bogdanoff. She has been married to Jean René André Yvon Guillaume since March 19, 1993. She lives in Vendôme in the Loir-et-Cher. Alain Poiré was a French film producer and screenwriter. He was born in Paris, and died in Neuilly-Sur-Seine. The Adventures of Arsène Lupin is a 1957 French crime film directed by Jacques Becker. It was entered into the 7th Berlin International Film Festival. It was followed by Signé Arsène Lupin. Georges Chamarat was a French actor. He appeared in 109 films and television shows between 1929 and 1981. He starred in the film The Adventures of Arsène Lupin, which was entered into the 7th Berlin International Film Festival. Arsène Lupin is a French TV show which was co-produced with German, Canadian, Belgian, Dutch, Swiss, Italian and Austrian TV stations. It is loosely based on the novels by Maurice Leblanc. Henri Virlogeux was a French actor. Henri Tisot was a French actor, writer, and humorist. He was best known for playing Adolf Hitler in the farcical film The Fuhrer Runs Amok, for his parodies of the speeches of General Charles de Gaulle, and for the television series La trilogie marseillaise. Arsène Lupin Returns is a 1938 American mystery film directed by George Fitzmaurice and written by James Kevin McGuinness, Howard Emmett Rogers and George Harmon Coxe. The film stars Melvyn Douglas, Virginia Bruce, Warren William, John Halliday, Nat Pendleton and Monty Woolley. The film was released on February 25, 1938, by Metro-Goldwyn-Mayer. Jacques Nahum was a 20th-Century French director, screenwriter, and producer, famed for producing the cult television show Arsène Lupin, descended from the Pallache family. ↑ "L'acteur Georges Descrières est mort". Lefigaro.fr. Retrieved 20 October 2013. ↑ "NY Times.com: Sun in Your Eyes". nytimes.com. Retrieved 24 January 2010.